Get Ready For Another Great Convention! 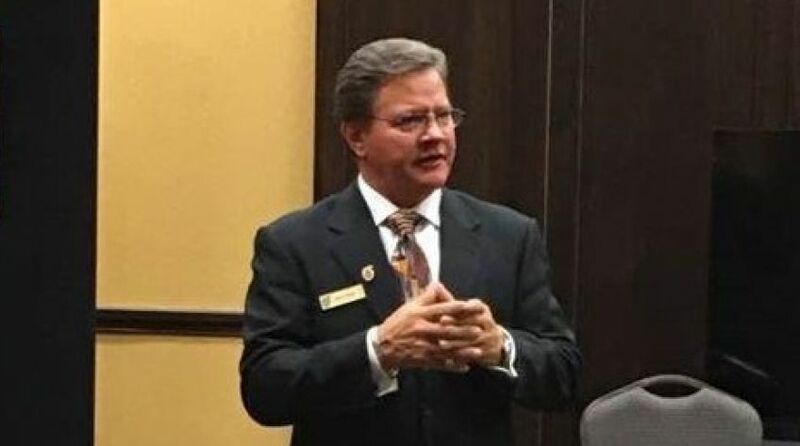 This three-day event includes seminars from a variety of national speakers and this year we are including a continuing education seminar on Thursday night with Kyle Swicegood. Need Real Estate CEUs? The pre-convention gets you 8* CEUs (*CEU approval pending). 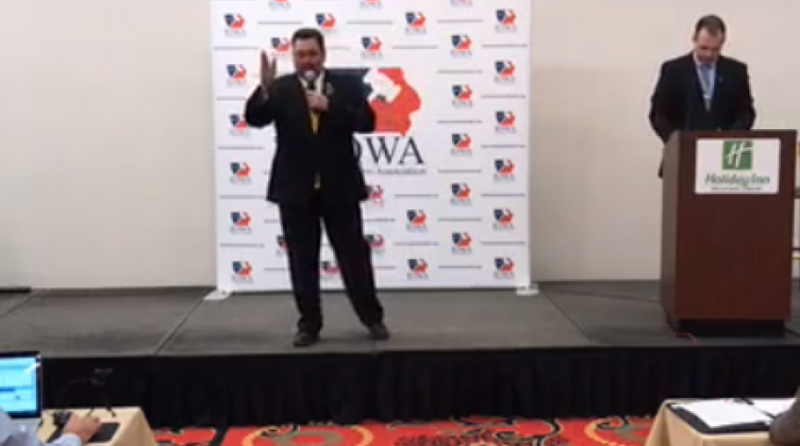 On Saturday afternoon, there will be a preliminary round of the Iowa Auctioneer contest with the audience bidding on the items and 3 judges scoring the auctioneers. The auctioneers will be competing to fill the top 20 spots to advance on to the finals held at the Iowa State Fair in August, as well as who will be named Rookie Auctioneer Champion. Join state fair patrons on Tuesday, August 14 on the Anne & Bill Riley stage at 9:00 AM to help support this amazing cause while witnessing 20 of the finest auctioneers represent the Midwest. Can’t make it to the fair on Tuesday? No problem! You may still support this great event by going to bidspotter.com and placing prior bids or joining in live through bidspotter.com. 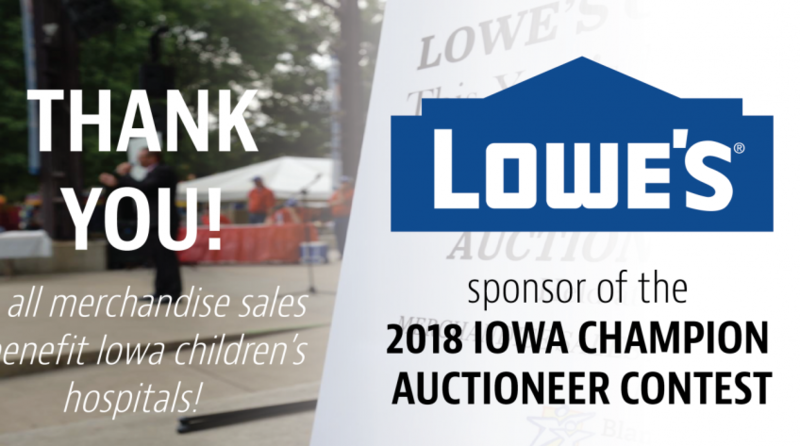 A very big THANK YOU Lowe's Compaines, Inc. of the Des Moines metro for making this event great by donating all of our auction items. Our auctioneers can showcase their talent while working to help benefit three children’s hospitals. Each year the sales of the auction items will be donated to one of the three children's hospitals on a rotating basis - Blank Children’s Hospital of Des Moines, University of Iowa Children’s Hospital and St. Jude Children’s Research Hospital. Des Moines, IA – On February 3, 2018 the Iowa Auctioneers Association (IAA) inducted Martha Boyle, Holstein, IA into the Iowa Auctioneers Hall of Fame. Martha is the 50th member and second ever female to be inducted into the IAA hall of fame since inception in 1974. The first female inductee was Jerilyn Ann Bergthold of Hannibal, MO in 2004. Martha grew up in an auctioneer family with generations of commitment to the industry. After graduation from the University of Notre Dame, Martha moved back to her hometown in 1992. Soon after began to work for the family business where she eventually became business partner with her father. Martha received her real estate license in 1999 and attended the Reppert School of Auctioneering in 2003. Highlights: 2018 IAA Convention Winners & More! Congrats to all that came and participated! 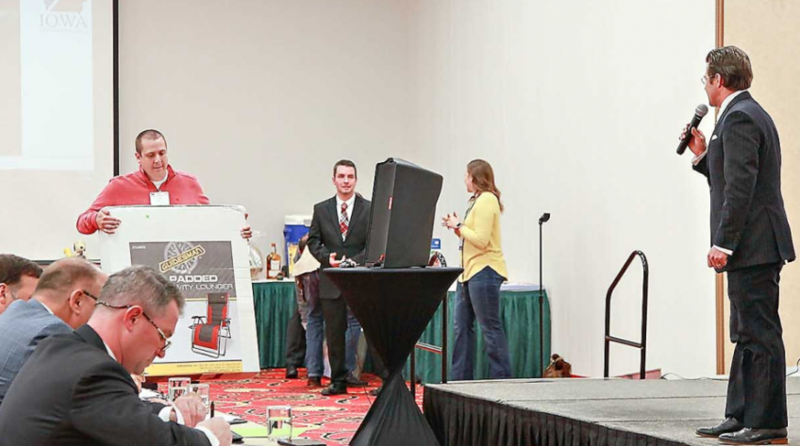 The Iowa Auctioneers Association annual convention attracts not only Iowa auction professionals, as well as professional auctioneers from across the country. The three-day event includes seminars from a variety of national speakers. Saturday, Feb. 3 contest where held to name the 2018 Ring Person Champion, the 2018 Rookie Champion, and determine the 2018 Iowa Auctioneer Contest finalists that will go on to compete at the Iowa State Fair in August. ATTENTION MEMBERS! Are you looking to print more business materials? Do you need the Iowa Auctioneer Association logo? Members of the association can place our association logo on their websites, business cards, and more, to show the public that YOU are representing a community of peers that promote friendship, networking, and best practices. 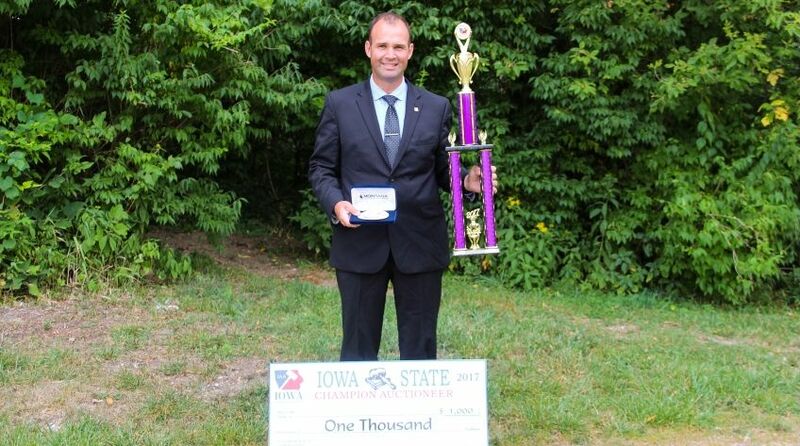 Jared Chambers of Corydon, IA was awarded the title ‘Iowa State Champion Auctioneer’ on Tuesday, August 15, 2017 at the Iowa State Fair during the Auctioneer Contest Finals. The top five finalists – Kam Hartstack of Clarinda, 3rd runner up, Justin Steward of Wyoming, 2nd runner up, Jordan Cannon, Central City, 1st runner up, and Jeff Graber of Lincoln, MO, reserve champion. 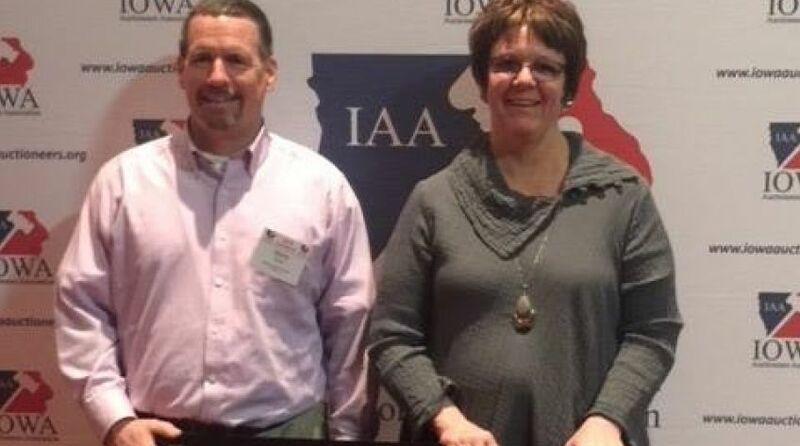 To make it to the Iowa State Champion Auctioneer contest each August, IAA members batten in our preliminary contest during the IAA Annual Convention in February. Our top 20 advance to the finals at the Iowa State Fair. Five judges officiate the final round at the Iowa State Fair. Contestants are rated on speed, bid calling ability, salesmanship, and appearance. 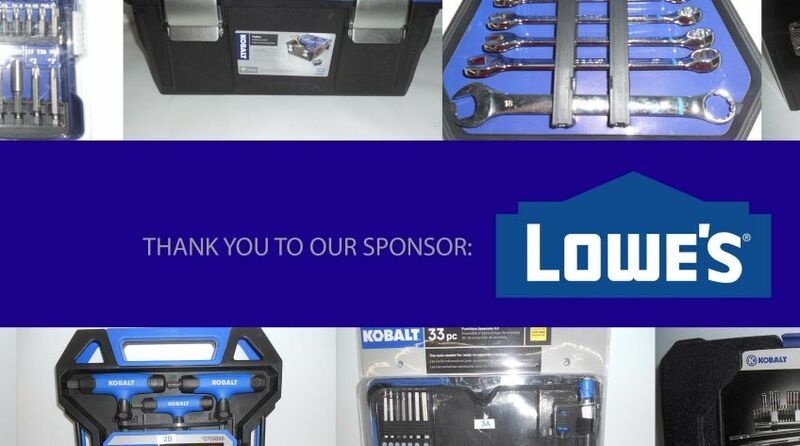 This August 15 at 9 AM our contestants will be auctioning off 55 Kolbalt tool packages donated by Lowe's Companies, Inc. Proceeds will benifit 3 of Iowa's childeren hospitals.